Home Programs & Research An Entrepreneur’s Guide to Going "B"
So you’ve decided you want to be more than just a company. You want to have a positive impact on society, promote corporate social responsibility, and use the power of business for higher purposes of social good. Now you’re wondering how this whole process works. Don’t worry, we’ve got you covered. 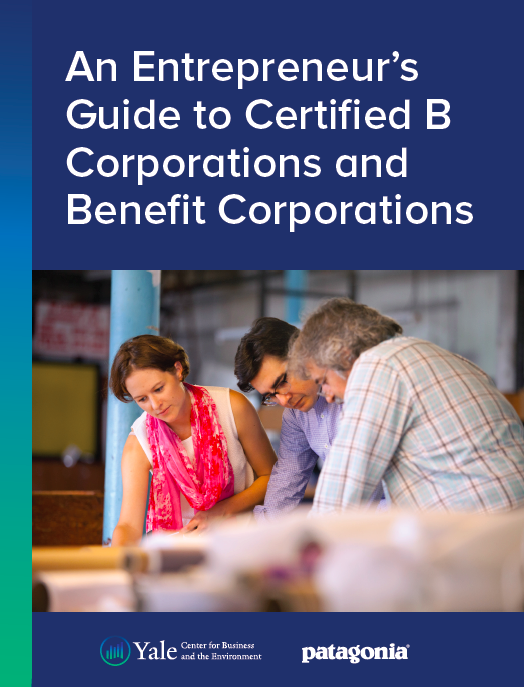 In partnership with Patagonia and the Yale Center for Business and the Environment, we have published An Entrepreneur’s Guide to Certified B Corporations and Benefit Corporations. In an era of “greenwashing” and misleading labels, Certified B Corporations and Benefit Corporations help consumers identify trustworthy companies. Signaling this commitment is a trend that has been catching on quickly, both domestically and abroad; to date, there are Certified B Corporations in 50 countries worldwide. Increasingly, entrepreneurs are considering how to create a company that has a positive impact on society, promote corporate social responsibility, and use the power of business for higher purposes of social good. Is B Certification or Benefit Incorporation the Right Decision for Your Company? Abi Barnes is the CEO & Co-Founder of Allergy Amulet, Inc. She has written extensively on social, political, and environmental issues, and has been published in several well-known periodicals and academic journals, including The Atlantic and Forbes. She is a graduate of Vermont Law School, the Yale School of Forestry & Environmental Studies, and Kenyon College. Photo taken in front of the Chouinard Equipment blacksmith shop, where Patagonia first took root. This report is brought to you by The Yale Center for Business and the Environment and Patagonia, Inc. The Yale Center for Business and the Environment provides a platform for gener- ating, incubating and launching innovative action at the intersection of business and the environment. The Center joins the strengths of two world-renowned graduate schools—the Yale School of Management and the Yale School of Forestry & Environmental Studies—together with an extensive network of internal and external thought leaders at the business- environment interface. Driven by student interest, we develop partnerships with a wide range of actors across Yale (students, faculty, staff) and in the professional world (alums, companies, NGOs, governments). Our work covers finance, entrepreneurship, marketing, operations, and strategy on issues involving energy, water, carbon, food, natural areas and society. Thursday September 14, 2017, 6:00 p.m. — 10:00 p.m.
Wednesday May 10, 2017, 6:45 p.m. — 9:30 p.m.
Tuesday May 9, 2017, 6:00 p.m. — 8:30 p.m.
Wednesday March 29, 2017, 12:00 p.m. — 1:00 p.m.
Friday March 3, 2017, 9:00 a.m. — 1:00 p.m.